This article recommends the best website builder for artists, photographers, writers and creative entrepreneurs wanting to create a website that is visited by lots of people. It compares several blogging and website platforms, such as Wix, Blogger, Squarespace, Weebly, and WordPress and is written by an experienced high school teacher, with a beginner audience in mind. It concludes with a step-by-step tutorial, showing the exact process used to set up a successful, high-traffic website. 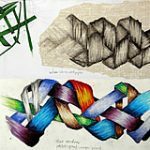 In 2011, I created a website to showcase my artwork and help high school art students gain good grades. One year later, this site was receiving over 1000 visits every day (this became the website that you are reading, the Student Art Guide). If I have learned one thing from this experience, it is that the internet holds enormous value for creative individuals. Making a website is the most effective way to market your work, build a brand and sell artwork, products or services. What’s more, creating a website is something that even a high school student (someone with little funds and no prior web design experience) can do. Worried that you don’t have the skill required? I had no idea how to make my own website when I began and was daunted by the prospect. I was the type of person who struggled to find the ‘on’ switch on a computer. To say I was technically challenged was an understatement. Luckily, creating a website was far easier than I had imagined. The graph above shows daily visits to my website over the course of the first year, reaching almost 1,200 visits a day within 12 months (the Student Art Guide now gains millions of visits each year). It used to be that great art was discovered by galleries; written manuscripts chosen by publishers. These days, great content is discovered first-hand by ordinary individuals. There is no longer a barrier between the artist and the masses. If you have an online presence – and your work can be found, shared, ‘pinned’ or ‘liked’ – you can achieve a level of recognition that could once only be dreamed of. A single image or blog post can receive thousands of views in a very short time-frame; be seen by vast numbers of prospective clients, admirers, and fans. If you are an artist, photographer, writer (or any other creative entrepreneur), you need to harvest the power of the internet and create your own website as soon as possible. There are many great social websites where sharing content is encouraged. These may be helpful for promoting your work, meeting others with similar interests, gaining feedback and (if you are lucky) selling work via word of mouth or automated systems, such as print-on-demand. Being an active member of community-based websites can be a great idea – and may indeed be a fundamental part of your online strategy – but these sites should complement, not replace, your own website. They should be used as a marketing outpost to drive traffic to your own website, not as a substitute for it. Many people search on Google looking for the ‘best free website builder for artists’ or a ‘free artist website’. Others look for more specific information, comparing various website builders, such as Wix vs Weebly vs Blogger vs Squarespace vs Google Sites vs Adobe Spark Page and so on. These platforms, along with many others, offer customizable websites for users, targeting those who are looking for an easy way to display their work online (these allow you to set up basic photography portfolio websites or graphic design portfolio websites, for example, usually with higher priced premium plans marketed alongside). These website builders are typically slick and aesthetically pleasing, with drag-and-drop templates that are appealing for beginners. Indeed, these can be a suitable option for those who wish to create a website to share with family or friends, or a temporary online portfolio, but they should never be used by someone who is serious about getting their website ranked highly in Google and seen by thousands of people every day. For the best chance of success, you need to create your own original website. 1. You need total control over the appearance and design. Aesthetics is important. Websites should showcase your creative work professionally and communicate style and individuality, helping you to stand out from the crowd. This cannot be achieved with a standard page on a free site, using a template that looks like a million others. With your own website, you can select a great design theme and customize this however you like. 2. You need to have an awesome website name, NOT yourname.freeservice.com. A website name is the starting point for your brand. For as little as sixteen dollars a year you can create the illusion that you are a professional worth investing in. Take your work seriously. With domain names costing so little, there is no excuse for not having your own. 3. You need to optimize your website so that it ranks highly in Google. Without the ability to optimize your content for search engines, your website is left floating alone in cyberspace, relying on endless social media promotion and kind visits from friends or followers. Humans must love your content, but just as important: Google must love it. Google has a secret (and constantly updating) algorithm that they use to determine where websites should appear in the search results. When someone types a query into Google, the search engine carries out a complex calculation (it takes a fraction of a second) to estimate which – of all of the websites it has discovered in the world – you want to see. According to Search Engine Watch, 33% of people click on the first result shown in Google, 18% on the second result, and even fewer on the third. If your website doesn’t make it onto the first page of results, only a tiny percentage of people will ever find it. As an example, when people type “A Level Art ideas” into Google (“A Level Art” is the name of an international high school qualification), Google ranks my website first. First out of the 686,000,000 other web pages that Google thinks might be about this topic. In fact, you can see that the Student Art Guide currently holds the first AND second position for this term. Thus, someone looking for A Level Art ideas is more likely to click through and visit my website than any other. One of the reasons that the Student Art Guide ranks highly in Google is that our articles are comprehensive, highly detailed, and take weeks to write. Another reason is that our content is well optimized for Google. This means that Google understands what each page is about, and people can find us. In fact, it is highly likely that you arrived at this very article after Googling “how to make an artist website” or something similar. 🙂 Well, this page is optimized for that phrase, and many other similar terms! Search Engine Optimization (SEO) is impossible on most free websites and social media. To make matters worse, Google knows whether your website is created using a free platform, and may perceive your website accordingly: as less professional, less serious, and less important. In other words, with a free platform, you must work that much harder to convince Google that your content is worth ranking, and, even then, you don’t have the tools to make this easy: you start with a disadvantage. This is one of the most important factors to consider when deciding whether to create your own website. 4. Schools and universities need to be able to view your content. Many schools and universities block all access to social media and free blogging platforms, because, as noted above, these are often used by scammers. Some teachers spend months creating a website using a free platform, only for the platform to be later blocked by their school. There are huge advantages to having your work discoverable from educational institutions, even for those whose websites are unrelated to education. 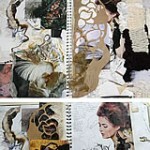 For example, students in the UK often find my artist website and study my artwork. Schools then link to my website. As authentic links from relevant websites provide a signal that a website is high-quality (links from educational institutions are considered extra-valuable), this makes Google trust my site and rank it even higher. Sites that are ranked highly gain more visitors. In summary, if you hope to gain traffic to your website, ensure that it is accessible to everyone. 5. You need your work to be celebrated, not lost in the crowd. When someone contemplates buying your artwork (or products) on a social website or a platform with multiple sellers, they may be distracted by countless other items showing up in a feed. You want buyers to be channeled towards your fantastic creations, without others competing for attention. On most social or retail websites, buyers are easily enticed away. 6. You need to control how you make money from your website. If you have your own website, earning opportunities are controlled entirely by you. You can sell artwork, products or services directly from the site; add advertising; seek sponsors; recommend affiliate products; embed print-on-demand items; or simply concentrate on building your brand, popularity, and fame. Social platforms and free website builders often place inappropriate advertising alongside your work or have strict policies governing the way you operate business upon their platform. It is very common for free platforms to plaster their own branding all over your website, attempting to direct your visitors back to them. Generating income from your own website is much easier. If you want to sell artwork online, for example, this can be achieved in a matter of minutes, by adding a ‘buy now’ button beside the work (this is shown in the tutorial below). Alternatively, you can add professional shopping carts or any other commercial feature. 7. You need to measure the number of visitors to your website and other important statistics. Google Analytics and Search Console are free tools built by Google that are easily integrated with your own website. Most free blogging or social media platforms do not allow you to use these, and offer inferior statistics, if any at all. Google Analytics and Search Console provide in-depth information about those who visit your site. For example, you can see which countries visitors are from; how many minutes they spend on certain pages; which pages they leave immediately and what they typed into Google prior to arriving at your site. This information is invaluable. It helps to shape and direct your creative work and improve your content for the future. 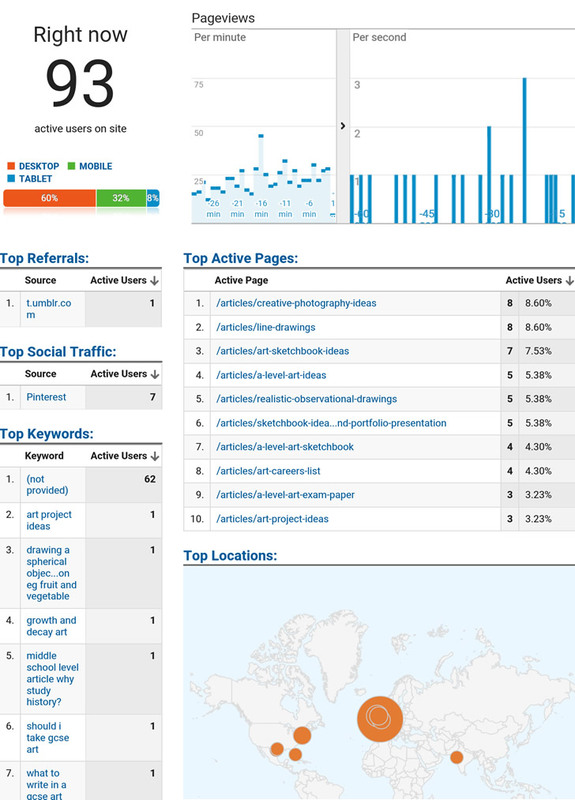 This Google Analytics report shows visitors to the Student Art Guide in real time. At that exact moment, 93 people were viewing the site, with 8 people reading a popular photography article. You can see the keywords people typed into Google to land on the website; which pages they visit; which country they are located in, and many other helpful pieces of information. This gives me a clear idea of why people come to my site; what content they prefer; and what they would like my website to provide. This tool has helped me create an art website that is visited by hundreds of thousands of people every single month. Without it, I would be flying blind. 8. You need the ability to build an email list. A few years ago, Facebook changed their newsfeed algorithm so that each ‘status update’ made from a Facebook business page was shown only to a small percentage of their followers. To have your posts shown to more fans, you were required to pay money to ‘promote’ these – even to those who have chosen to follow your page (this is still the case). As such, the value of having a large Facebook following diminished overnight, crippling many small businesses who relied on Facebook to reach their audience. Similarly, YouTube recently made significant changes to their algorithm, affecting which videos are shown in the subscription feed, making it more difficult for creators to get their videos seen. Social media platforms are businesses that prioritize their own interests. If you have the option for your audience to safely share their email address with you, you don’t need to be at the mercy of third parties: you can contact your followers whenever you like. An email list is an asset that you can backup, and keep, giving you direct contact with your audience, no matter what happens. Almost all online entrepreneurs regret not starting an email list sooner. An email sign-up box can be added in a couple of minutes to your own website. 9. You need to be able to easily move your website files from one location to another. If you start with a free blogging platform and then later come to the realization that you should create your own website (as most who are serious about marketing their work online eventually do) moving your content from a free platform to your own website is very difficult (it may require manually cutting and pasting every item – recreating the website all over again). In addition, if you decide to switch from a free website name (i.e. yourname.freeservice.com) to another website name, any search engine authority that you have built up with Google will be lost, with the new website required to work its way up the rankings again from scratch. Whatever method you choose to create an online presence, it needs to be portable. Moving, downloading or backing up material from your own website is simple – you have access to every single one of your files and can export these with a few clicks. 10. 100% of the website must belong to you. As stated in our communication in January 2018 and subsequent site banners; as of July 31st, 2018 all Free and Classroom Wikis were disabled and are no longer accessible. In addition, platforms can ban you or delete your files and there is nothing you can do about it. They can suddenly be overtaken by a more successful platform, as happened when Facebook increased in popularity and MySpace dwindled. They can be sold to another company, who may run things totally differently, such as when Flickr was bought out by SmugMug. If you have the potential to create a beautiful, stunning website, it is too risky for this to be at the mercy of another company. It is too valuable of a resource. 1. Older websites rank higher in Google. There are many factors that influence where a website appears in search engines (the higher you rank, the more visitors your website receives). The age of the website is one of these factors – a signal that your website is more likely to be a genuine, authority site. The sooner you start, the sooner you can begin to build your website’s authority with Google. 2. Website names are limited. As time goes by, fewer quality website names (known as ‘domain names’) are available: yourname.com may already be gone. Many great domain names have already been purchased and are being resold for thousands of dollars. You can search to see which ones are still available here. 3. Your age and current circumstances are not a barrier to success. You do not need to wait until you are older, have more time or are more ‘successful’. Creating a website sounds daunting, but it takes only an hour to get up and running. Many great websites are built by young people, with little funds or resources. Teenagers as young as 14 have seen huge online success. With parental permission, you can get started while in high school. Setting up a website can be an excellent project for a high school Art, Design or Technology student. With hard work, a website set up during high school can be earning money by the time you are in university or college. Furthermore, the skills you learn while creating a website can help your employment prospects immensely at graduation. The best thing is that the whole process is fun. It is exciting – almost addictive – watching people from all over the world land on your website and view your content, day after day. What is the best way to build an artist website (or any website, for that matter)? There are two basic ways to create an original website. The first is to start with a prebuilt ‘content management system’. A content management system can be thought of as something like Microsoft Word. It is a program that makes the process of creating a digital document MUCH easier. Content management systems are designed for the ordinary user, so that coding is not necessary. They save time and money while allowing for creative one-of-a-kind outputs to be achieved. The second way to create an original website is to hire developers (or learn to code yourself) and build the entire thing from scratch. Even if you have sufficient funds to hire a developer, or know how to code, in almost all cases, it is wise to use an existing content management system. Not only does this save you time and money, but a site that is built from scratch is much harder to maintain, as only the person who understands how it works is the one who built it. When you use a popular content management system, on the other hand, there are hundreds of thousands of people who use the same system and who have written tutorials sharing advice. If at any point you get stuck, there are answers to just about every question you could imagine online. Additionally, there are thousands of developers who specialize in each popular content management system. This means you are not reliant on a single expert who knows your website well nor vulnerable if this expert leaves. The upshot: Unless you have a team of specialist developers and are trying to create something like the next Facebook, using a content management system is far-and-above your best option. Which content management system should I choose? Many of the free website platforms (such as Weebly, Wix, and Squarespace) are in fact a kind of content management system, however, these are simplified and tied to a single company, leaving them with many weaknesses, as discussed above. The leading content management systems are ‘open source’: this means they are maintained by a huge collection of expert developers around the world (rather than connected to a single company). As such, they follow best coding practice and are kept up-to-date. According to 2018 data, the leading content management system is WordPress (used by 60% of the market), followed by Joomla (6%), and Drupal (4%). Not only is WordPress the most popular content management system, but nearly 30% of all websites in the world run on it. I have used WordPress since 2011 and recommend it above all else. It is hands-down the best website builder for artists – or for anyone else who wishes to create their own website (the only exception is if you wish to create a website that has a huge shopping cart and is connected to accounting software, able to track a large inventory of product – for this you may wish to consider Shopify). For entrepreneurs, bloggers, writers or artists who wish to market their services, promote products or create any other kind of content-based website or blog…WordPress is the best solution. 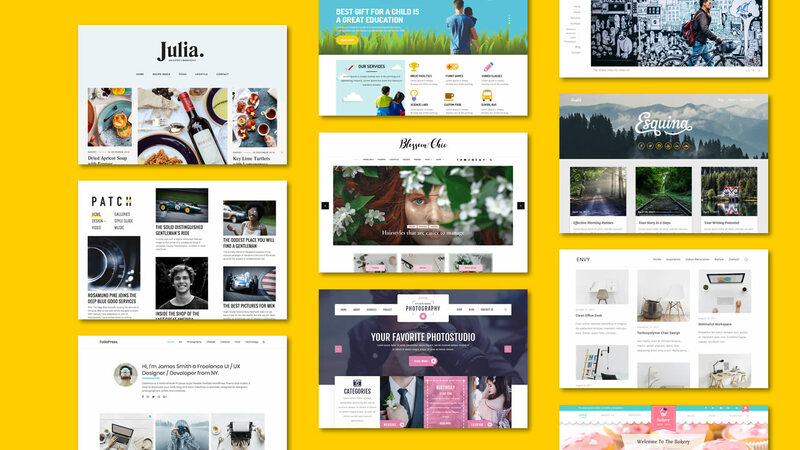 A sample of the 6,000+ free WordPress themes available, suiting any kind of topic or niche. WordPress can be customized to look like anything – from an informal blog (a casual, comment-driven website) to a professional business website. 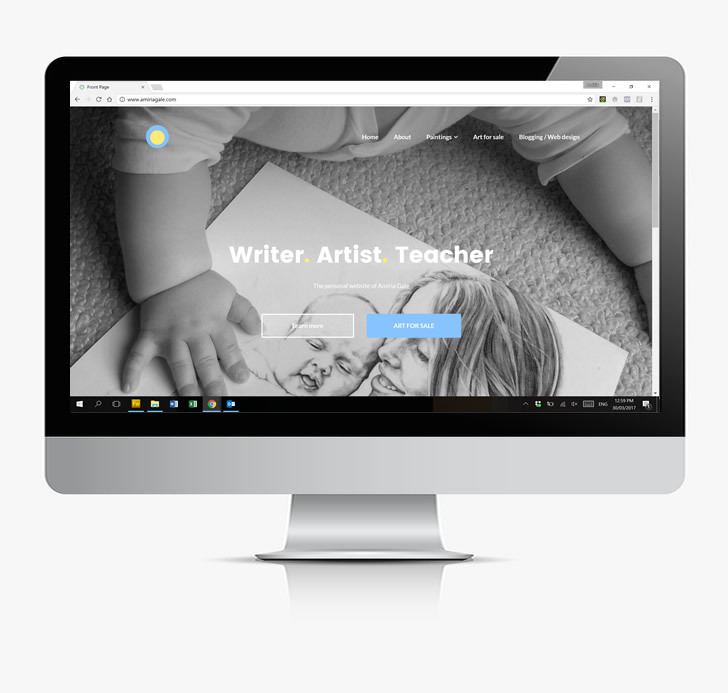 It can be used to create a stunning online art portfolio or to present work in any way that you desire (written text, illustrated articles, scrolling images, embedded video clips and so on). Just as you can add an ‘app’ to your phone to add extra functionality, you can add ‘plugins’ to a WordPress website, enabling your site to do almost anything (there are over 52,000 WordPress plugins available). As an example, there are free plugins to add email forms, social share buttons, buy now buttons, shopping carts, email sign-up boxes, search engine optimization and so on. To change the appearance of a WordPress website, you click a button to activate a new ‘theme’. Some WordPress themes are simple and minimalist; others are complex. All can be customized, depending on your needs. 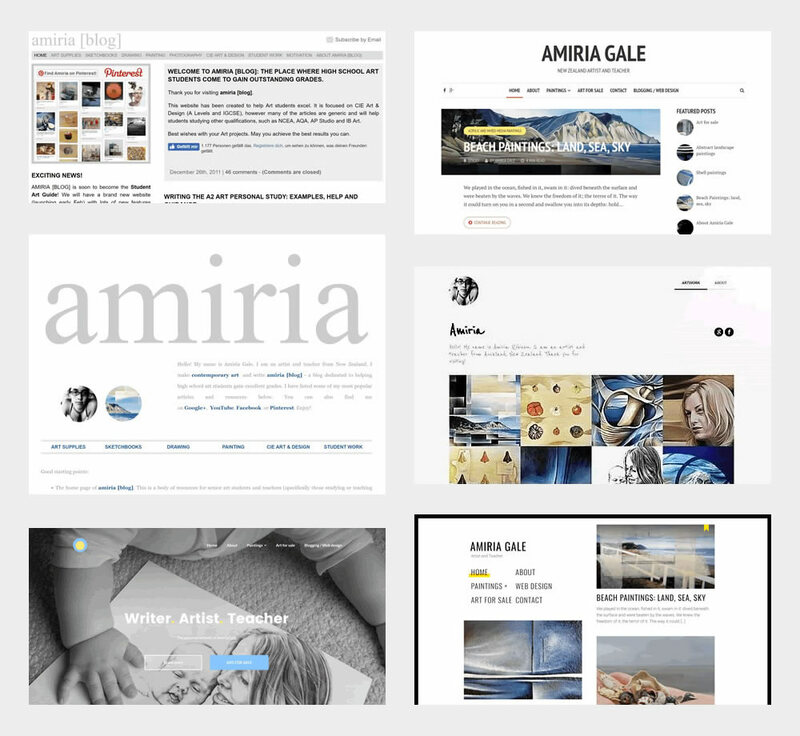 The image below shows how my personal artist website www.amiriagale.com has morphed and changed over the years: beginning with a very simple WordPress theme. These screenshots show how the appearance of my artist website (built using WordPress) has changed over the years. All of these images show the same WordPress website, with different themes and customization options selected. How hard is WordPress to use? Once you are familiar with WordPress, it has a similar difficulty level to using Microsoft Word. As with anything new, however, the first few days can be frustrating. A beginner hasn’t learned where all the buttons are, so every task requires consciously thinking through the steps. To complicate matters, the sign-up process uses terminology that is foreign to most people, making the whole thing seem unnecessarily daunting. To help ease beginners through this process, I have created the tutorial below. This screenshot shows me editing my artist website using WordPress. You type directly in the central box, selecting italic or bold etc. (the published page can be viewed here). WordPress is harder than sharing something on Facebook or slapping together a free drag-and-drop website. But it’s not nearly as hard as you think. Once you get through the first few weeks, it is very straight-forward. In a way, it is almost good that it appears daunting, as this cuts out many of your potential competitors, and gives you an advantage. WordPress itself is free, however, you need to purchase a website name (the domain) and a place to store your website files online (this is called hosting, and is explained in more detail below). WordPress is the software or tool that is used to create the website (just as Microsoft Word is used to write a document). However, in order for people to see and visit that website, it needs to be stored online somewhere, and be freely available. For example, if you built your website on your own computer, every time you turned your computer off, your website would be offline. To have your website online 24/7 – and available for others to visit, yet protected against hackers and viruses (this is not an easy task, as hackers constantly use automated software to crawl the net looking for loopholes) – you need to find a company who specializes in web hosting. Every website needs hosting. Places that offer free websites pay for the hosting themselves, in exchange for making money in other ways. Facebook, for example, offers you free space to upload photos and chat with friends, while they make money from advertising. Wix and Weebly offer basic free websites, knowing that some users grow frustrated with the limitations of a free plan (as per all the issues described above) and then buy their premium plans. In other words, you may not pay for the hosting initially, but you pay for it in other ways. The best option is known as a self-hosted WordPress site. This is one that is built using WordPress and stored safely online at a professional web hosting provider of your choosing. This gives you far more flexibility than any of the premium packages offered by the likes of Squarespace, Wix or Weebly, for a much lower price. It also gives you the most security and peace of mind, because you can easily move your website from one hosting provider to another, if needed: you are not reliant on a single company. The website is owned entirely by you. A note about wordpress.com and wordpress.org: Confusingly, there are two official WordPress websites: wordpress.com and wordpress.org. Wordpress.com allows you to set up a basic free WordPress website: this is not advisable, for the reasons listed above (for example, you cannot add plugins, cannot use a wide range of themes, cannot monetize the site, cannot collect email addresses, cannot sell artwork, and so on). In order to customize your WordPress website fully, you need to use the complete, open source version of WordPress, which is described at WordPress.org (you don’t install WordPress on your computer – everything is taken care of by your chosen hosting provider). Signing up for hosting and installing WordPress is very straightforward and takes only a few clicks. This is shown in the step-by-step tutorial below. A domain name: this is the website name, such as studentartguide.com. Website hosting: this is space on a large server where you store the website files so that your site can connect to the internet (I recommend SiteGround). A content management system to build the site, such as WordPress, which is free. DISCLOSURE: The Student Art Guide provides content free-of-charge so that all students and teachers can access our resources. We make money through advertising and affiliate links. In this article, we link to hosting providers that we recommend completely: our reputation and success depends upon this. Purchasing hosting via these links allows us to continue to deliver quality resources to you, for free. 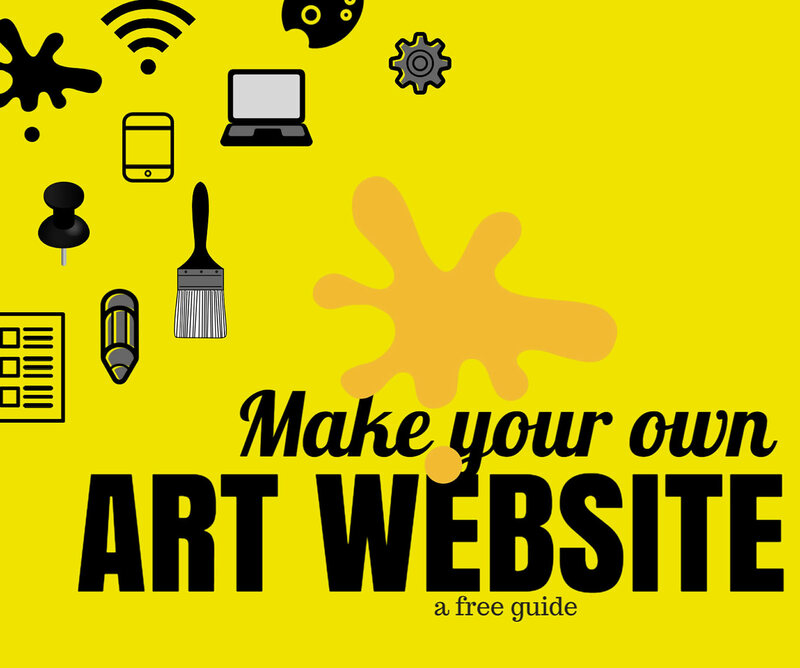 The first step is to come up with a website name, such as www.studentartguide.com. 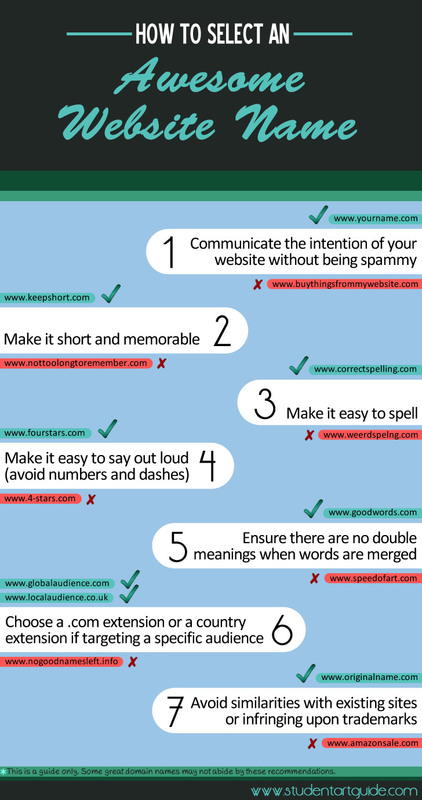 These tips are communicated in the infographic below. If you are looking for name ideas for a visual artist website, common formats include: www.yourname.com, www.yournameartist.com, www.yournamephotographer.com and so on. Sometimes website names include keywords related to the particular genre of artwork (such as www.yournameportraits.com) however you should be careful to select a name that doesn’t limit you unnecessarily. The role of a web hosting company is to provide you with space on their server to store your files so that your website is accessible on the world wide web 24/7. Most hosting companies sell domain names also, allowing you the convenience of purchasing both from the same place. 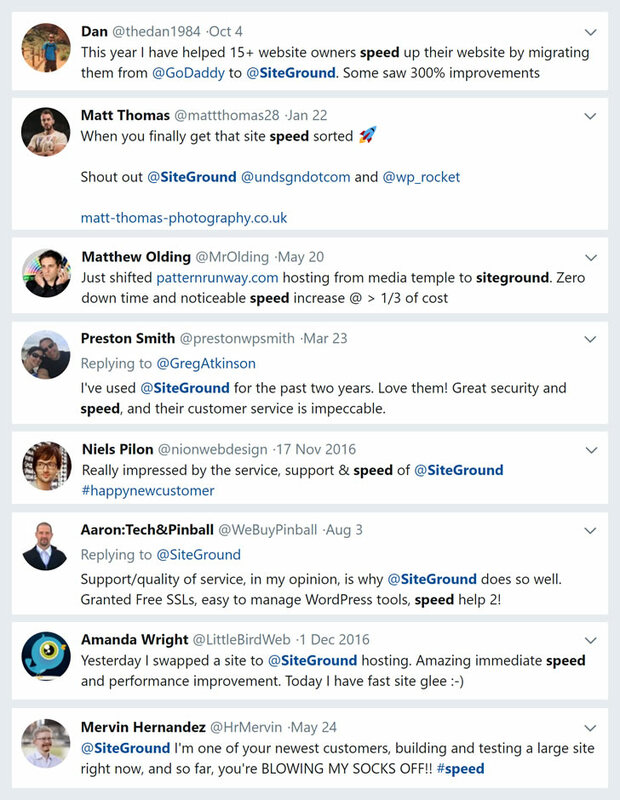 After testing a large number of hosts over the past six years, I recommend SiteGround completely. I use them for all my websites, including the Student Art Guide. SiteGround is the only hosting provider that is officially recommended by all three of the leading content management systems (WordPress, Drupal, and Joomla). 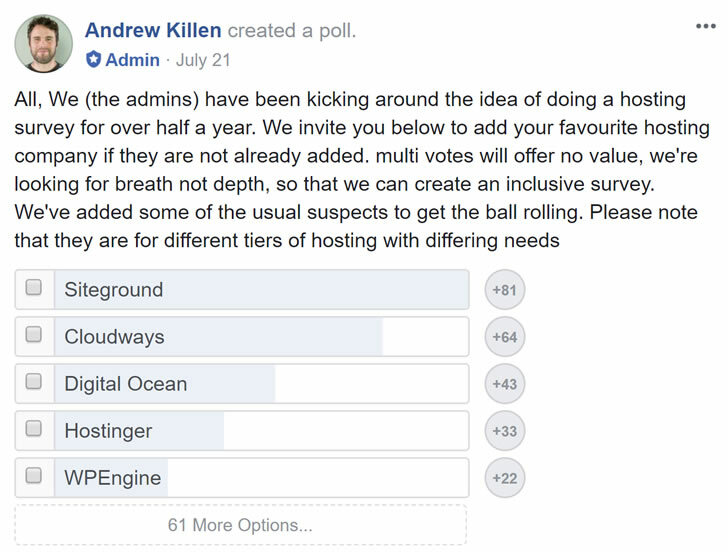 They were also recently voted by members of the WordPress Hosting Facebook Group as the number 1 website host as shown in the screenshot below. Even the famous Joost de Valk, founder of Yoast SEO (whose whole business revolves around helping people drive traffic to their website from Google) recently moved his business to SiteGround. Uptime (how often your website remains live on the internet). All hosts go down occasionally, for scheduled maintenance and so on, but this should occur rarely. SiteGround has an uptime of 99.99%. Security. When creating a website, you trust a hosting provider with your content, data and other confidential information. The cheapest, low-quality hosts often have poorly maintained servers, with out-of-date software that loads slowly and is vulnerable to security breaches. SiteGround is proactive about keeping their servers up-to-date and their client information safe. Server speed. There are many factors that influence how quickly a website loads; one of these is the speed of the hosting server. A slow website irritates users and reduces the time they spend on your site. Speed is also one of the factors that Google uses to rank a website in search engines. SiteGround uses the latest technology and has a caching plugin to speed things up further. In addition, they enable ‘Cloudflare’ for free. Cloudflare is a series of servers, positioned all around the world, storing temporary copies of your content, so that your website loads quickly, even if a visitor is located far away. For those with image-based websites, like artists, this is a huge benefit, as images typically load more slowly. Customer Support. The most outstanding aspect of SiteGround is the quality of their support staff. They are knowledgeable, helpful, and communicate things in a clear way so that a beginner can understand. This aspect of hosting cannot be underrated, as having knowledgeable assistance on-hand instantly, 24-7, ready to answer any question, is highly valuable. Many companies cut corners on this aspect and it is an area where SiteGround stand head and shoulders above the rest. Price. SiteGround currently has a discount on their StartUp package, which works out at $3.95 per month. This price is within the reach of many students. They also have a GrowBig package, which allows you to create an infinite number of websites for the single price, instead of just one (there are a few other differences, for example, GrowBig is slightly faster, however, for most beginners, the StartUp package is all you need). Compare SiteGround packages here. As mentioned earlier, you don’t install WordPress on your own computer – you install it at your hosting provider, using a few clicks of a button. The following SiteGround WordPress tutorial shows the entire process of setting up a new WordPress website at SiteGround. Following this tutorial gives you your own website, live on the internet, in less than an hour. I update this tutorial regularly: this version was published in October 2018. If you prefer text-based instruction, please view our SiteGround WordPress tutorial (this is a complete text-based guide for beginners). Visit SiteGround to create your own website! If you love creating beautiful, artistic things, building a website will be no different. In fact, it will probably be your most fun project yet. If you are a Graphic Design or Technology student, consider approaching your teacher to see if designing the layout and graphics can become your high school project brief. Get started now!